For Veterans Day last week, PJ and I drove up to Columbus and visited the Wexner Center for the Arts, which is exhibiting “Transfigurations: Modern Masters from the Wexner Family Collection.” It’s a well designed show, and we really enjoyed seeing these works. As the title suggests, the exhibit is a collection of paintings, drawing, and sculptures from the private collection owned by the Wexner family, who are major donors to the center. The artists in the exhibit are Edgar Degas, Pablo Picasso, Jean Dubuffet, Alberto Giacometti, Willem de Kooning, and Susan Rothenberg. I especially enjoyed seeing the work of Dubuffet (1901-1985), with whom I was previously unfamiliar. Dubuffet was born in France and, according to Wikipedia, “His idealistic approach to aesthetics embraced so called “low art” and eschewed traditional standards of beauty in favor of what he believed to be a more authentic and humanistic approach to image-making” (source). This is an image of “Dhôtel” from the Wexner exhibit was my favorite one. It is oil paint and sand on canvas and was produced in 1947. As the Wexner website explains, “his portraits act more as caricatures, in which one or two defining features serve as the only connection to the subject. 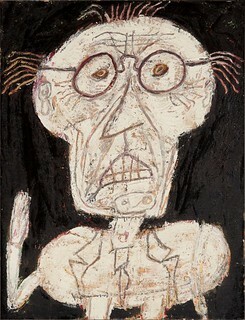 For Dubuffet’s depiction of the novelist André Dhôtel, his likeness is boiled down to exaggerated versions of the subject’s glasses, three shocks of hair, and the creases of his forehead” (source). What stands out to me about this work is its emphasis on the figure’s skull. It thus becomes a kind of memento mori, an increasing contrast between the infinite lifespan of art and the morality of the artist. I think it’s an amazing piece. I also enjoyed seeing the work of Rothenburg (b. 1945). A major subject of her work is horses that often seem to represent power and vitality for her. As usual, there is also a lot of educational materials in this exhibit. Those, along with the collection’s website, make this an excellent opportunity to see great art and learn about the artists who created it. I highly recommend it.